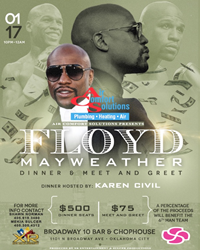 Air Comfort Solutions to present Floyd Mayweather Appearance. “It’s not every day that a fighter of Floyd Mayweather’s stature attends a Thunder game or offers to meet his fans in this type setting,” Norman said. "Tickets will go very fast as word of this reception and dinner." Fresh from his comeback boxing match with Conor McGregor, Floyd “Money” Mayweather, who remains undefeated after 50 professional fights, will attend a reception and dinner in his honor at the Broadway 10 restaurant in Oklahoma City on Wednesday, January 17, presented by Air Comfort Solutions. Mayweather will make his appearance at the event after sitting courtside for the Oklahoma City Thunder - Los Angeles Lakers basketball game at the Chesapeake Arena. According to Shawn Norman, president of XR Tickets and one of the event organizers, Mayweather’s appearance will offer fans of boxing in Oklahoma City a once in a lifetime opportunity to be up close and personal with one of the sport’s greatest legends. You can purchase tickets online by visiting: https://www.ticketstorm.com/event/floydmayweatherdinnerandmeetgreet/broadway10chophouse/oklahomacity/20592/. Portions of the proceeds from Mayweather’s appearance will go to 6th Man Sports, which instills academic excellence, values, discipline and leadership in student athletes.